The latest edition of the National Housing Construction Index compiled and issued by Link2Plans (www.link2plans.com) shows Offaly has the third highest drop in applications. The team of researchers at www.link2plans.com have examined every housing construction planning application and planning commencement from January to August 2013, in the production of the National Housing Construction Index. The Index gives a direct comparison with the exact same period in 2012. Viewed on a nationwide basis, the National Housing Construction Index reveals there is a decrease in planning applications (-6%) but project commencements were down even further (-10%) since last year. Offaly reports the third worst drop of applications in the country at a fall of -29% since last year. Applications made in Offaly decreased from 117 in January to August 2012, to 83 in the same period in 2013. Compared to just a -2% decrease in applications last year, the rate of decline has shown a sharp negative reversal. Besides Offaly, Leitrim, Sligo and Meath exhibit the largest application drops with -39%, -31%, and 26% respectively. Only six counties show planning application increases: Kildare (12%), Dublin (7%), Carlow (7%), Donegal (4%), Monaghan (4%) and Kerry (2%). However this is up on the same period last year when only two counties saw increases – Donegal and Leitrim (5%). Commencements in Offaly have also declined by -27%, from 66 in January to August 2012, to 48 in the same period in 2013. This shows a worsening of performance for Offaly from the previous year where commencements only dropped by -3%. Commencement increases were seen in only five counties: Roscommon (51%), Longford (8%), Meath (8%), Dublin (8%) and Wexford (3%). Having said that, on a national level the outlook is positive from last year when commencements were down by -16% nationally compared to this year having a decline of just -6%. 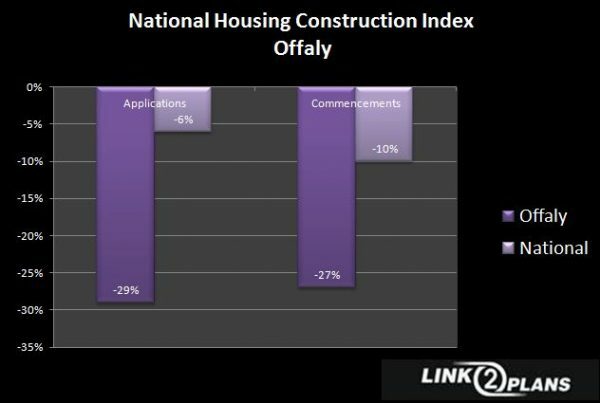 According to the Managing Director of Link2Plans, Danny O’Shea, the index shows that there is an overall trend of falling planning applications but the rate of decline is less pronounced than last year and this may be a positive contributory factor leading to an increase or at least a further slowdown in the decline of commencements. Offaly however, continues to see a decline in the number of planning applications made so it is expected to see a further drop in level of commencements later in the year.